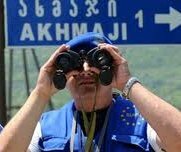 TBILISI, DFWatch–Russian soldiers’ moving of the de facto border between Georgian- and Russian-controlled territory is being followed by European Union’s observers in the area. Yesterday evening, the European Union Monitoring Mission to Georgia (EUMM) stated that it is monitoring the installation of fences near Ditsi. “Freedom of movement is one of EUMM’s key priorities, a patrol has immediately been sent to the spot in order to verify and monitor developments on the ground,” the statement reads. The Foreign Affairs Ministry of Georgia calls on the Russian Federation to stop putting up barbed wire close to the de facto borders of Abkhazia and South Ossetia. The ministry was responding to events yesterday when Russian soldiers erected barbed wire fences and started building concrete buildings thought to be border posts inside Georgian-controlled territory close to the villages Ditsi and Dvani. According to the statement by the Foreign Affairs Ministry, this activity is a violation of the ceasefire agreement which Russia and Georgia signed on August 12, 2008, after fighting a five-day war. Georgia also calls on international organizations and partner countries to react ‘appropriately’ to recent events. EUMM confirms that this issue will likely be considered at the next meeting of the Incident Prevention and Response Mechanism (IPRM) on May 31. Tuesday evening different people, including students, well-known artists, singers and ordinary citizens plan to hold a small rally organized by Club of Liberty outside the old Russian embassy building in Tbilisi to protest against what the Russian soldiers are doing. Organizers say the goal is to make a stand and protest against Russia’s recent actions, but also to inform the international community and diplomats in Georgia. Participants will demand that the government takes active steps and that it ensures the security of people living in the villages close to the de facto border. Russia does not formally have an embassy in Tbilisi. The old embassy building is formally the Swiss embassy, but a Russian consul with staff inside are handling visa issues.